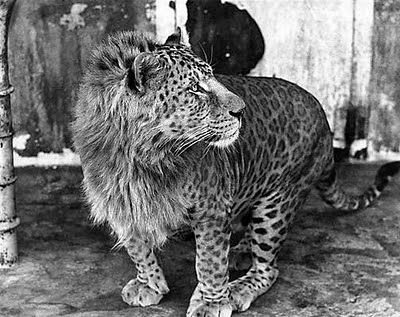 The first documented leopon was bred at Kolhapur, India in 1910. Its skin was sent to Reginald Innes Pocock by Walter Samuel Millard, the Secretary of the Bombay Natural History Society. It was a cross between a large leopard and a lioness. Two cubs were born, one of which died aged 2.5 months and the other was still living when Pocock described it in 1912. Pocock wrote that it was spotted like a leopard, but that the spots on its sides were smaller and closer set than those of an Indian leopard and were brown and indistinct like the fading spots of a juvenile lion. The spots on the head, spine, belly and legs were black and distinct. The tail was spotted on the topside and striped underneath and had a blackish tip with longer hairs. The underside was dirty white, the ears were fawn and had a broad black bar but did not have the white spot found in leopards. 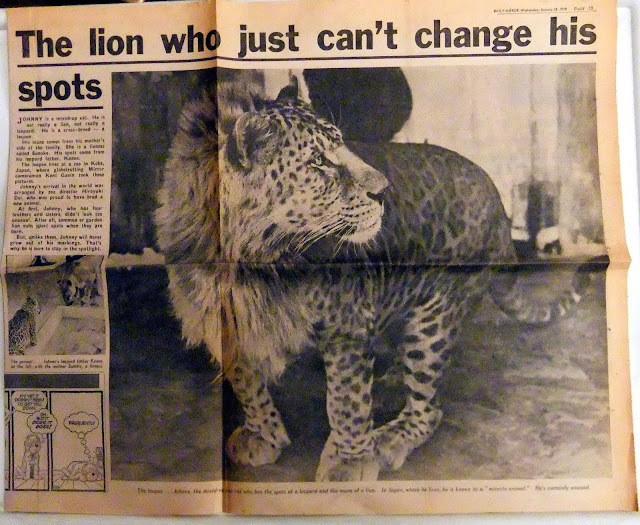 Pocock wrote that the closest he had previously seen to this type of hybrid was the lijagulep (Congolese Spotted Lion) bred in Chicago. They have been bred in zoos in Japan, Germany, and Italy (the latter was a "reverse leopon" i.e. from a male lion and a leopardess). Karl Hagenbeck, who produced many different hybrids, recorded the birth of leopons at the Hamburg Tierpark in Germany, but none survived to maturity. A leopon skin and skull at the British Museum comes from the animal bred at Kolhapur Zoo in India and was donated by Lt. Col. F.W. Wodehouse of the Junior United Services sometime between 1920 and 1940. The most successful leopon programme was at Koshien Hanshin Park in Nishinomiya City, Japan. A lioness called Sonoko was mated by a leopard called Kaneo. The lioness voluntarily assumed a position on her side to allow the much smaller leopard to mount her. A litter of 2 hybrids was born in 1959 and 3 more were born in 1962. In captivity, the normally solitary male leopard remained with the family (social behaviour is sometimes seen in captive specimens of normally solitary big cats). The hybrids proved to be sterile and the last one died in 1985. However, later leopons have successfully fathered cubs with liguars, hybrids between a male lion and a female jaguar. The resulting animal is called a leoliguar. The programme of cross-breeding was popular with the public, but it was criticised in zoological and animal welfare circles.